We're just starting the holiday season here in the UK and we're starting to see a drop-off in calls to our support desk already. Don't worry though - if you do need help with our asbestos software systems Alpha Tracker, Tracker or Tracker Mobile our support staff will be here 24x7 as usual. ESSS - Environmental & Site Safety Solutions - have gone live with asbestos software Alpha Tracker. ESSS will be using their tablets to collect asbestos records whilst on site, transmitting the photos, site plans and data and back to the Alpha Tracker cloud server. 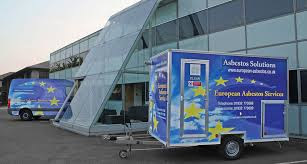 Our latest "switchers" to our asbestos software Alpha Tracker are European Asbestos, an established independent licensed asbestos removal and management company providing asbestos removal to the UK and Europe. Kim visited European's impressive HQ yesterday to deliver training to the asbestos surveying team and the system administrators. Practising Tracker Mobile skills in the sun! Another asbestos consultancy has been trained this week to use Alpha Tracker, Start Software's software for asbestos surveyors and consultancies. Here are a few of the photos from today's training sessions - welcome on board! Two of the asbestos industry's leading consultancies, Redhills and Lucion, have today announced a new partnership and a strategic move to integrate their businesses. See http://www.lucionservices.com/gamechanger/ for more information about this development. Start Software's 10 years in the industry mean that we have crossed paths with both organisations many times in the past and we have lots of friends within both companies - directors, management and staff . All of us at Start Software wish the new venture the very best of success and look forward to seeing your partnership develop in the future. This new version of the module has improved processing for close-up photos, especially those which have been annotated on site within Tracker Mobile (see http://robinbennett.blogspot.co.uk/2016/05/annotated-photos-now-available-in.html). Do contact our support desk if you need help applying the update. We've just completed a quick review of throughout across our Alpha Tracker asbestos consultancy client base. This week has been the busiest on record with more than 200,000 surveyed items being captured since Monday within the companion data collection app Tracker Mobile. Imagine the pain of having to capture this amount of information on paper and then having to key it into a report! Our systems aren't perfect - no software is - but the savings we deliver to our customers mean that they are more profitable, more efficient and deliver better service to their customers. Our aim is to deliver #zeroadmin for our customers with everything possible being done automatically. If we can help you to automate your asbestos consultancy business, do get in touch. 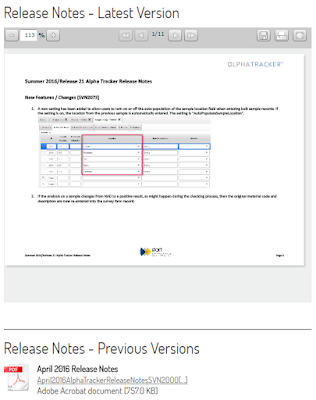 The Summer 2016 update to asbestos software Alpha Tracker is now available for download. 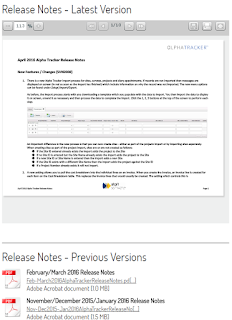 Known as Release 21, this update has 25 new features, bug fixes and performance updates since the previous release. Approx. 30 bugs have also been found and fixed. Please note: You need the latest version of the Alpha App Server on your system in order to deploy this update so please do contact us before installing so we can double-check that you are set-up and ready to take advantage of all of the new features. We've just completed another Alpha Tracker asbestos software installation, this time for asbestos consultancy West Four. West Four's experienced consultants provide the full range of asbestos, fire risk and heath-and-safety services. Determined to employ the principles of excellence and accuracy, West Four will be using Alpha Tracker to help deliver their the clients the very best service. Based in Chiswick, London, West Four welcome contacts from new clients looking for the very best in asbestos consultancy. Click here to find out how to contact them to discuss your requirements. Can we help your asbestos consultancy to deliver services more efficiently and to improve the service you give to your clients? Contact us at Start Software to discuss how Alpha Tracker could help your business too. June's support stats are in and we can see that the support team (Jack, Oliver & Elaine) have had the best month this year when dealing with high priority calls. Nearly 100 urgent calls came into the help desk and 96% were resolved within 2 hours (or the timescale that the customer set). 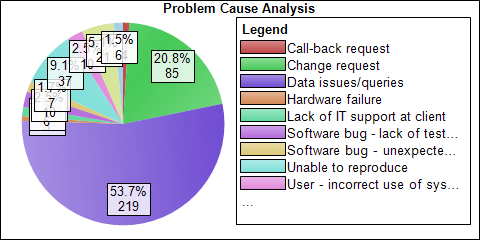 and only 5% were related to software bugs. Details of how to contact the support desk can be found on our website here. Alpha Tracker Release 21 - the summer blockbuster! Click here or on the screenshot above to read them. Later this week we'll be producing our usual YouTube video to run through the highlights of this summer 2016 update to Alpha Tracker - our software for asbestos surveyors and consultancies. Keep an eye on the blog for the video and a summary of the changes we've introduced this time. We're really pleased to announce that two new Alpha Anywhere developers have joined our software development team. We're the UK's biggest alpha software development house with hundreds of web and mobile applications deployed worldwide. We'll post more info about our new guys when we've got around to taking their photos! In the meantime, if we can help you with a web or mobile application get in touch.